Now's your chance to win one of three pieces made by Stephen while helping a great cause! When Stephen Colbert visited with licensed art therapist Rachel Brandoff for a segment on The Late Show, he found some emotional relief in the process of painting and drawing. Now, for the first time, Stephen is making his art pieces available through this public auction, with 100% of the proceeds going to the American Art Therapy Association. You can watch Stephen's full art therapy segment segment on the Wednesday, March 14, 2018 episode and see which issues he was able to work out. How do I bid on Stephen's art? 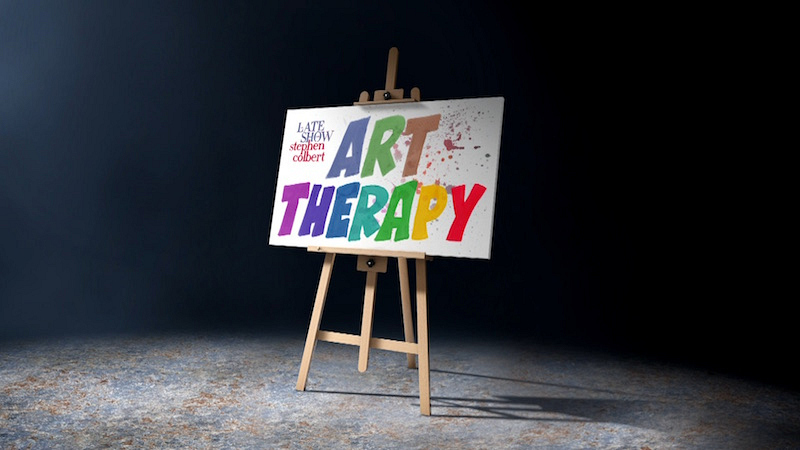 What is the American Art Therapy Association? We'll let them put it in their own words: "The American Art Therapy Association is an organization of professionals dedicated to the belief that making art is healing and life enhancing. Our mission is to serve our members and the general public by providing standards of professional competence, and developing and promoting knowledge in, and of, the field of art therapy." What did our lawyers have to say about this? Auction open to U.S. residents age 18 and over only. By clicking on these links, you will be leaving CBS’ website and will be going to a website that is not affiliated with CBS. CBS is not responsible for the content or availability of any linked website, and you agree to be subject to the Terms & Conditions of any linked website.